How Juan Solanas's "Upside down" messed up its theatrical release. - Films de Lover, films d'amour et comédies romantiques. How Juan Solanas's "Upside down" messed up its theatrical release. Disclaimer : This is an account based on various Internet sources. We had to conjecture for some parts as our requests for interviews of some people involved in the film were unsuccessful. May 2009. Cannes Film Festival. While the stars are walking the Red Carpet to attend screenings of the most prestigious film festival on the planet, Grégoire Melin is busy trying to make a film come true. Based on a vision by award-winner Juan Solanas, "Upside Down" is a love story between two people from different worlds that face each other and are separated by different gravities. Melin is the managing director of Kinology, the company in charge of selling this vision to investors during the 2009 Cannes Market. Also a producer, Melin is charged with one difficult mission : finding the two lead actors. As Variety reports in an article published on the May, 16th 2009, he may have found them with Kristen Dunst and Emile Hirsch. First visual from "Upside Down" taken from Kinology line-up. Kinology's line-up for the 2009 Cannes Market features one visual and a small description of the film as follows : "Look up to the sky and rub your eyes because you won’t believe what you see: cities, forests, and oceans with their own inverted gravity, only an arm’s length away, yet completely unreachable. Take a leap over to this alternate reality, two worlds - one above, one below - facing each other, and you’ll land in the extraordinary world of Upside Down, the new ground-breaking film of Juan Solanas, the director of the innovative Cannes and César-prized short film "The Man Without A Head" and the team behind "The Matrix" and "Dark City"." The producers are Aton Soumache for Onyx Films and Andrew Mason who is credited here as line & executive producer. It is the first and only mention of his name related to "Upside Down". After that line-up, Mason, who was "the team behind "The Matrix" and "Dark city"", probably quit the film in its early stages since its IMDB profile does not mention it. October 5th, 2009. Pre-production begins. In a press release published on its website (now unavailable), Transfilm, a Canadian production company that participates in the financing of "Upside down" alongside Onyx Films and Studio37 (a French branch from the telephone company Orange) announces the beginning of the pre-production. The budget for this feature film is estimated at $ 50-60 millions, quite a budget but maybe not enough to bring Solanas's vision to the big screen. ""Upside Down” is an independent movie, which means basically 100% of freedom in a creative way but 100% of money problems", explains Solanas in an interview for a Polish website published in 2012. "You always are at the limit and need to find solutions inside your budget. You can not ask for more." Money, money, money. That is the main problem as far as Frédérique Dumas, the head of Studio37, is concerned in an article published by Variety in May 2010. "They [Hollywood studios] said, ‘This is great, but we don’t know about this European director — if you give us the project, we will do it our way.’ We had a strong faith in our project, so we preferred to say no. We were able to make it for $50 million; they would have made it for $150 million in a more Hollywood style.” At that point, it looks like the producers had strong faith that "Upside down" could be the first of European blockbusters that would be a big hit at the U.S. box-office and even worldwide. October 16th, 2009. Jim Sturgess is cast as Adam. Jim Sturgess steps in as Adam, as details /Film website, in lieu of Emile Hirsch for unknown reasons. "I was looking for Adam and Eden in flesh and bones, not in a physical way, but in their soul," says Solanas later during his interview for the polish website. "When I saw Kirsten I knew in the moment that it was her, the same with Jim. Then I crossed my fingers hoping that they were free and that we could make a deal." A first rough poster (see here) surfaces with Jim Sturgess and a person who is not Kirsten Dunst. It does not even look like a person to be honest. This poster was used to promote the film and looks really similar to what the marketing around the film release in Europe will be four years later. March 8th, 2010 - Shooting begins. In another press release published on its now-unanvailable website, Transfilm announces the beginning of the "Upside down" shooting in Montreal, Canada and that the theatrical release should occur in 2011. It is the first time a release date is publicly announced for the film, but it won't be the last one. In April 2010, Warner Bros France also publishes a press release about the film. Whilst no other distribution company has been announced for the United States, it appears Warner Bros will handle at least the French theatrical release. June 5th, 2010 - Shooting ends. Transfilm communicates again about the film in so many words : ""Upside down"'s shooting in Montreal ended after 55 days. Dirsten Dunst, Jim Sturgess and Timothy Spall left after a very busy shooting. Post-production will begin at the end of June. Producers hope to show some promo reels at the Los Angeles American Film Market in November." December 19th, 2010 - The first official images surface. Was "Upside down" there at the American Film Market in November. We do not know for sure but we did not find any evidence that it was. However, more than six months after the last we heard of it, the first official images of the film surface on the Internet on a French blog. Thses are two pictures (with green screens that will later be replaced by special effects) and the first official poster for the film, featuring Kirsten Dunst and Jim Sturgess in a familiar position that will stick to the film promotional material. What is really interesting though are the words at the bottom : "Delivery : May 2011". With the shooting ending in June 2010 and the year-long post-production, that release date seems plausible. October 24th, 2011 - First test-screening in Los Angeles. Nothing happened in May 2011. Nothing happened for ten months actually, even if IndieWire thought the film could "crop up in the festival circuit in 2011". And then one day in October 2011, two years after the beginning of pre-production, JimSturgessOnline reports that a screening of the film took place in Los Angeles for a handful of lucky people who were just at the right time in the right place. January 2nd, 2012 - The French trailer is published then withdrawn from the Internet. 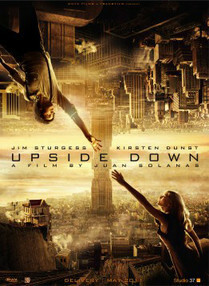 This date is when the worldwide theatrical release of "Upside down" really started to act funny and irrational. It all started with the publication of the French trailer on Canal + website. The trailer seems legit and goes viral. JimSturgessOnline reports on it again and explains that it was brought to its attention by François Dumoulin, a man who works in the special effects department of the film and apparently very eager to show his work to the fans. Some people love the trailer, some other hate it, it appears on every movie website. At this time, we thought "Film's ready, trailer's ready, it's just a little hiccup. Release will be scheduled soon." Not really. March 28th, 2012 - Mark Isham claims he's working on the film soundtrack. A new mystery arises when website Buzz Focus publishes an interview of Mark Isham in which the famous composer explains that he's currently working on the soundtrack. Since day one, the soundtrack has been given to Benoit Charest to compose. His name will ultimately be the one on the final poster but it makes you wonder how involved has been Mark Isham in the film's soundtrack. Was it only additional cues or a complete overhaul of the score ? We asked around for comments on this without any luck. April 12th, 2012 - "Upside down" selected for Cannes Film Festival ? 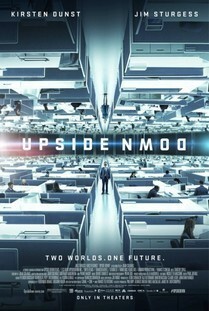 In a noble attempt to exorcise the many delays of the film, website ioncinema adds "Upside down" among its bets for 2012 Cannes Film Festival selected films. After all, it could have been true since Solanas won a prize there in 2005 whereas Kirsten Dunst won the Best actress Palme in 2011 for "Melancholia". We do not know if the film has been submitted and refused or if it was submitted at all. May 23rd, 2012 - Test-screening in Paris. A French user from IMDb reveals he saw the film during a test-screening in Paris. "I watched it yesterday for a screening test and although the movie was not yet finalized...it was pretty bad. We had to give our opinions in writing but there was so much incoherence and the plot was just flat." On Allocine, another one tells a similar experience. "The film is not finished yet. It's in post-production so you could see it was not finished. From what I could hear, it was not really liked by the other viewers." First piece of information : the film is not ready anymore. Maybe it never was, or marbe it went back to the editing room after the Los Angeles screening. Reviews are in both case very mixed and it could have been two very different cuts of the film. Second piece of information : a release date for France appears on Studio37 website : August 22nd 2012. Still no news about a release in the U.S.
August 23rd, 2012 - The film is released in Russia. The film was not released in France on the 22nd of August but it was released in some part of Eastern Europe during summer of 2012, and most noticeably in Russia on the 23rd of August. Why that peculiar strategy ? According to various sources, the film would be a bigger hit in Russia if there were no European or American bad reviews before its release there. However, it did not prevent the film from tanking at the box office with only $6 million in Russia (57th film in 2012 at the Russian box-office). September 27th, 2012 - Blu-Ray released in Russia. Following its theatrical release in Russia, the Blu-Ray is available there but only with the Russian audio. A clever trick to avoid non-Russian speakers to download and see the film prior to its release in other parts of the world. A clever trick yes, but also a dangerous one when it comes to the "life" of the film in theatres. No explanations were given regarding this strategy but we have to give them the benefice of the doubt. After all, they are the professionals who wanted to show Hollywood how blockbusters were made in Europe. October 5th, 2012 - "Upside down" on the road to the Academy Awards ? "Upside down"'s release is officially pushed back to December 10th, 2012 and English website Hey U Guys seems to think that it could be because "Upside down" eyes Academy Awards noms. Here is a film that nobody saw in its final form and yet, it has been announced at Cannes, or in various festivals and now the Academy Awards. 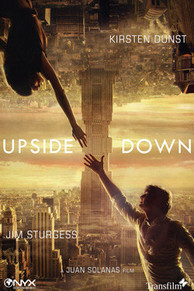 October 26th, 2012 - "Upside down" to be converted to 3D ? How to attract moviegoers to watch a film that has apparently great special effects but was already released in some parts of the world and is available on the Internet? 3D ! That's the latest trick in the sleeve of the producers (or distributors whoever are in charge of this mess they call a film), as announced in an article published on website "The 3D company". The film was not specifically made for 3D so it needs to be converted. Even if it is a costly procedure, this could be a way to gain a bit more money when the film hits the theatres, 3D tickets being more expensive than regular tickets. As expected, the release is pushed back again, some time in March 2013 for the U.S.
December 18th, 2012 - An English version of the film is available online. The 2013 release date takes a serious hit when an English copy of the film leaks to some torrents websites. In a couple of days, thousands of people download the film that has been so long in the making, ruining for good any chance the film had at making a profitable run in theatres. The responsibility of the leak falls onto the Motion Picture Association of America that as a result "started an internal investigation on its practices" according to Wikipedia. The real question after this leak lies with the cut of the film that has been leaked. On a French forum, an insider reveals on December 30th 2012 that "a first cut has been released in some Eastern countries. But the producers were not happy with it so the film is back to the editing room since. They do not know how to edit it apparently." In a nutshell, there is a cut that has been released in August, a leaked cut (identical to the Russian one ?) in English, a French cut still in the editing room and a 3D conversion. It's the end of 2012 and one thing is clear about this film : it is a complete mess. February 16th, 2013 - The French poster and trailer are released. After the film being pushed back from April 17th to May 1st, the French trailer and poster are published and the film looks the same except for one particular thing : the colors are livelier. No more sepia tone, the film has colors and it shows them even if it looks like some teal and orange colors that Hollywood loves so much for its blockbusters. In the US, the distribution company decided to change a bit the art of the poster making it bleaker and more desperate. However, it is strange to see that both in France and in the US, even on the official website, there is absolutely no mention of the 3D version. The 3D signs are not displayed on the posters. What happened there ? Another mystery to add to the very long list of mysteries surrounding this film. 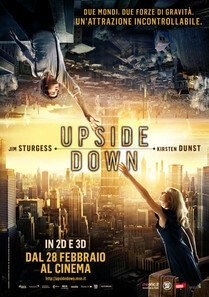 February 28th, 2013 - "Upside down" is released in Italy... in both 2D and 3D. This really is the gift that keeps on giving as one visitor informs us that "Upside down" was released in Italy in both 2D and 3D. So the 3D version exists but it will not be released in France and US for reasons we don't know. A quick round-up of european releases show that the film was or will be released without the 3D version in Spain, Belgium and Turkey. No release dates have been set up for United Kingdom and Germany. I have never seen such a poorly distributed film. Remember when the producers were saying that money was the big problem of the film ? It will be now as of the 28th of February 2013, the film only grossed $ 9 million. Its only shot at being a hit would be to be released wide in the US. Well, even that was messed up. 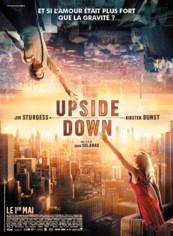 March 15th, 2013 - "Upside down" is released in the United States. Apparently, "Upside down" does not deserve to be released wide in the US. Instead, it only made it to 11 theatres. 11 theatres in the whole country whereas it was shown in 241 theatres in France. During its first US week end, it grossed $30 000, out of its estimated-$60 million-budget. Total, it grossed a bit more than $100 000 in the US and $15 million worldwide. The big blockbuster from Europe tanked even more than its producers probably thought it would but they had it coming. Back in 2011, it would probably have made a decent run but after everything that's happened, there was no way this whole thing could have ended well. Not a single interview Solanas made talked about the delays. All that Solanas said was that the shooting was a complete nightmare, because of the money-related problems. 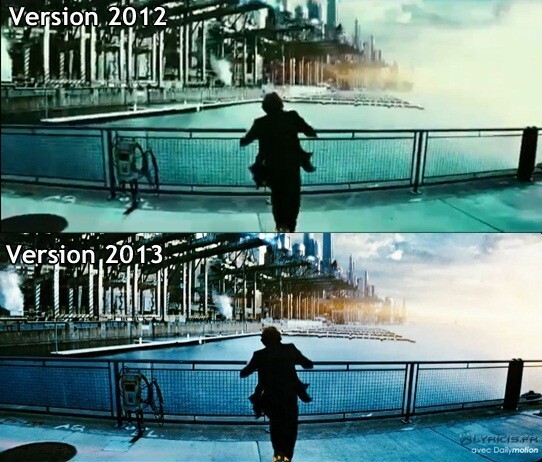 But you also have to wonder what went through the head of the producers and distributors to change and change again that film that is in the end probably not as different as it was back in 2011. The true story behind the making of that film would be a great one to read and I personnaly hope that one day we will know everything about that story. But wait, there's more. 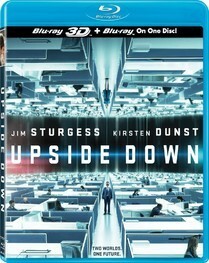 May 5th, 2013 - "Upside down", 3D and Blu-Ray release. Between "Upside down" and 3D, there's a love-hate relationship going on. Some countries had a 3D theatrical release, more had not. In a review of the film by the French Blog Orange (a branch of Orange, so a sister company of Studio37, one of the production companies of the film), the film is hailed as a great one (well, that figures) but it also says this : "Solanas chose to shoot his film in 2D because he believed that 3D could tarnish and ultimately pervert the image". Well, that's not a really nice thing to say when your film is being released to 3D and it probably shows that maybe the 3D conversion was not Solanas's choice. It gets better. The always well-informed JimSturgessOnline announced at the same time of the review that two Blu-Ray editions of the film would be released in the US at the end of June 2013. The first edition will feature the DVD and Blu-Ray of the film and the other edition the 2D... and 3D Blu-Rays of the film. That's extraordinary. Why bother release the 3D version for the very big screens in theatres when you can sell it for people to watch on their smaller screens. What an extraordinary story of failures and succ... well no, just failures. Thing is, it's really not a very good film. Thanks for posting the story of this film's distribution. I remember the trailer being released and then pulled in 2012. I am watching it now. Since I saw the trailer back in 2012 I was excited to see it. The story seemed very intriguing. But sadly no release in an city near me in the US. But then a savior, Netflix, comes out of nowhere with it about a month ago. I thought to myself, "Wasn't this just in theaters?" After that, I thought it wasn't a terrible movie. Believe me, this year had a bunch of terrible movies, Lone Ranger, Turbo anyone? It's not a bad film, but it was terribly produced and came out two years later than it should have. I got here searching how was it possible this film had such a bad box office run. What a messed up release! It also came to few theaters here in Chile, but not in my town so I didn´t catch it. I thought it was an OK movie plot-wise, maybe a bit overkill on the CG for some, but for me it was visually stunning. Merci pour le récit. It's a really beautiful movie. It's an independent work, very different from what we usually see. The acting is superb, as well as the FX and the plot. A great surprise. 10/10. It is a shame that Upside Down had such a painful and unpromising genesis. However, its painful birth has nothing to do with the merits of the finished work of art. As a finished movie, it is a beautiful work of art. The movie brought me in to an expansive, magical world. The rich music, the tango, the soaring spaces and height reeled me in. The "Dos Mundos" (two worlds) concept was a powerful metaphor for the gulf between two lovers and between two social classes. On a political level the movie was a rebuke of any coercive aristocracy where a supposedly superior upper class uses police power to oppressive those "below." In the end, that divide was rebuked by the individualism of the movie. Adam was obviously as smart as and as worthy as anyone from the upper world. And Adam and Eden deserved every right to love each other. The movie was sumptuous, soaring, a magical romantic sci-fi fantasy. I loved it. Incidentally, I am just a fan. I have no connection with the movie. I ended up on this website because I was looking to see what subsequent movies the writer/director, Juan Solanas, has done. I am very saddened that I could find none. I hope he is actively working on something new and great, and that the commercial failure of this movie has not deterred him. Mr. Solanas is a great director/writer. The vision in this movie is unique and beautiful.